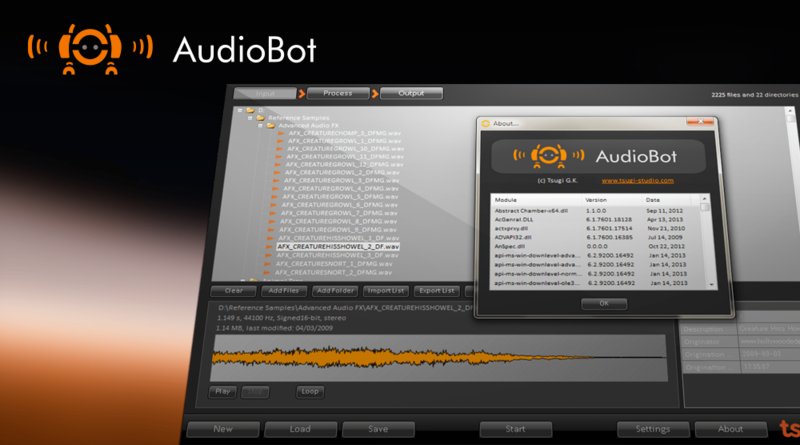 We are proud to announce the release of AudioBot 1.1. This is an entirely free update for current AudioBot users that can be downloaded here. Don’t use AudioBot yet? No worries, you can still boost your productivity by downloading the new 1.1 demo and learn more about all the features of AudioBot in this video. AudioBot has revolutionized batch processing for interactive audio by providing features previously unheard of. Indeed, it is the only batch processor allowing the export of sound files towards game audio middleware such as Wwise, FMOD and ADX2, not only adding the wave files to the project but also creating banks and events on the fly and configuring them. Other unique features include random playback modes, automatic creation of PDF catalogs of samples or even HTML web sites to browse your collection of sound files, folder watch to process new files as they are created or copied, processing over multiple sessions and much, much more. More importantly, AudioBot keeps going on and can process hundreds of thousands of files if needed when common batch processors routinely choke on a few thousand files or even less. Check out some of the major game studios trusting AudioBot to deliver massive amounts of perfect audio files on a tight schedule on the product’s page and try it yourself! We bet that you have more creative things to do than writing automation scripts or processing files manually!